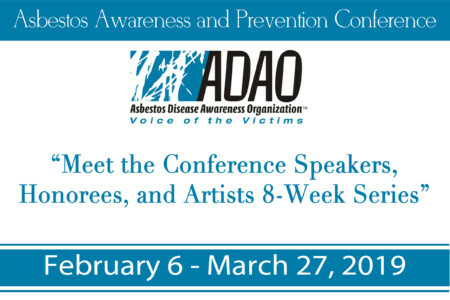 ADAO is excited to present the 2019 weekly “Meet the Speakers, Honorees, and Artists” blog series ahead of our 15th Annual International Asbestos Awareness and Prevention Conference. This series, which will highlight a new individual or organization each week, will introduce you to our esteemed speakers, honorees, and ADAO leadership. We are so grateful for the support of these dedicated individuals who sacrifice their own time and resources to attend and share their knowledge with our community. As the only U.S. nonprofit that organizes annual conferences dedicated to preventing and eliminating asbestos-caused diseases, ADAO hopes that this year’s conference will be even more powerful than those of years past. We look forward to sharing the stories of our conference speakers and honorees with you, and to welcoming you to our 15th Annual Asbestos Awareness & Prevention Conference April 5-7, 2019 in Washington, D.C.!